Finding meaning and purpose in what you do for a living is arguably a better way to live. 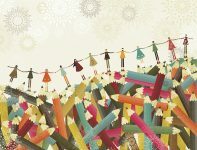 Nurturing an organizational culture in which work has meaning and connects to a purpose (beyond making money) is arguably a better way to run a company. Why? In part 1 of this article we began to explore what Catherine Mattice, a consultant, coach, and trainer had to offer about workplace bullying, including its similarity to harassment and the differences under the law. Today we’ll look at the importance of accountability as well as some methods for preventing bullying. When Can You Say No to Religious Garb in the Workplace? Summer is often a busy time with vacations, and it’s also a great time for teambuilding and an opportunity for employee engagement. Here are five ideas.